Due to the devastion of Hurricane Katrina, we are not able to offer reservations at the hotels in Biloxi list below. 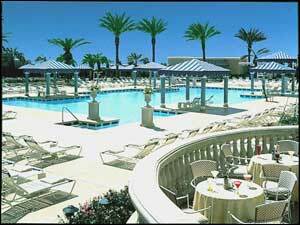 If you are traveling to Biloxi, here are hotels available near Biloxi at this time. 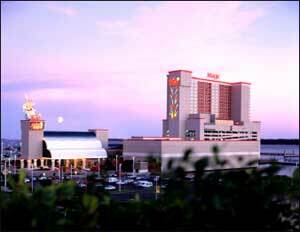 The Grand Casino Biloxi Bayview Hotel and Spa adjoins the casino and theatre by a climate controlled skywalk. 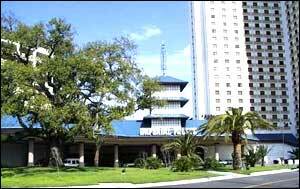 The Bayview Hotel and Spa opened in February 1998 as a resort/convention hotel to compliment the Grand Casino, Grand Theatre, and the Grand Casino Biloxi Hotel. The Grand Casino Biloxi Bayview Hotel and Spa features 500 deluxe rooms, each with in-room coffee, iron and ironing board, hairdryer, and room service. It features the Bellissimo Spa and Salon, a gift shop, convention and meeting room level, Lobby Bar and Restaurant, large outdoor heated pool, jacuzzi and poolside snack bar. Covered valet and self parking are complimentary. With 1088 standard rooms, jacuzzi suites, king rooms, and luxurious penthouse suites, the Imperial Palace is ready to pamper you in the style and comfort that guests expect from top resorts around the world. Each guest room is meticulously cared for and equipped with coffee maker, blow dryer, iron and ironing board. Handicapped and non-smoking rooms are available. Room service, valet service and free covered parking are also available. Gulf Beach Resort is a beautiful 7-floor highrise across from beach. Private balconies, 24 hour Waffle House Restaurant, live entertainment nightly in one of our 2 lounges, 3 outdoor swimming pools, interior hallways, in room coffee, centraly located among area casinos closest 1 mile, coast coliseum 1 block, Keesler AFB 4 miles, airport 9 miles, shopping mall 1 mile located on city trolley route. Beau Rivage Resort and Casino is a 1714 room resort with a mediterranean themed casino, 12 distinctive restaurants, world class entertainment, a full service spa and salon, deluxe marina facility, and a wide variety of shopping. The unique pirate theme makes for an unforgettable fantasy stay at Treasure Bay Casino Resort. This 262-room hotel stands in contrast to the 18th century pirate ship casino and medieval fort on the beach. Treasure Bay Hotel offers a variety of room accommodations and rates. There's gulf view rooms with a panoramic view of the pirate ship gaming vessel and fort, and miles of water and sugar-white sandy beaches. There's tower rooms with a sweeping view of Treasure Bay's two-tier tropical swimming pool with waterfalls. Or you may select a poolside room overlooking landscaped gardens of palm trees, blossoming shrubs and flowers. Located on the white sands of the Mississippi Gulf Coast, Casino Magic is the perfect vacation getaway filled with deluxe accommodations, thrilling casino action and distinct dining options. Truly a world class casino resort. Ramada Limited Biloxi Beach is where all the fun begins, located between Mobile and New Orleans Biloxi has lots of fun things to do. 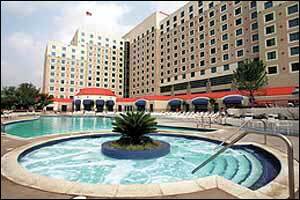 Biloxi has 9 fantastic casinos which have lots of gambling, entertainment, and finger lickin' food. Biloxi also has fine restaurants and nightclubs, lots of golfing (packages available) and 26 miles of beaches where you can jog, swim, fly a kite, jet-ski, fish and a whole lot more. Across the hotel you have an amusement park, on the right of the hotel is a water park where you and the kids can have some splashing fun, on the left is a Chinese restaurant and a drug store.